Honolulu (157.863W 21.311N) is the chief commercial port of the Hawaiian Islands. Its climate is uniformly warm and relatively dry, since the city is shielded from the trade winds by the Koolau Range. In other words, it is very nearly a tropical paradise. Honolulu was the location of a U.S. naval station until this was relocated to Pearl Harbor in 1913. The station was never more than an elaborate coaling station. 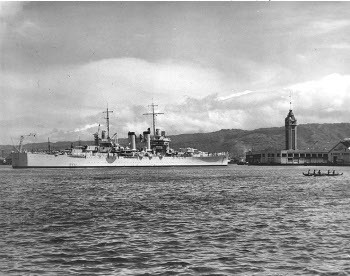 By 1941 the port of Honolulu handled the 25 ships per day needed to maintain the civilian population, since Oahu was no longer self-sufficient in food production.